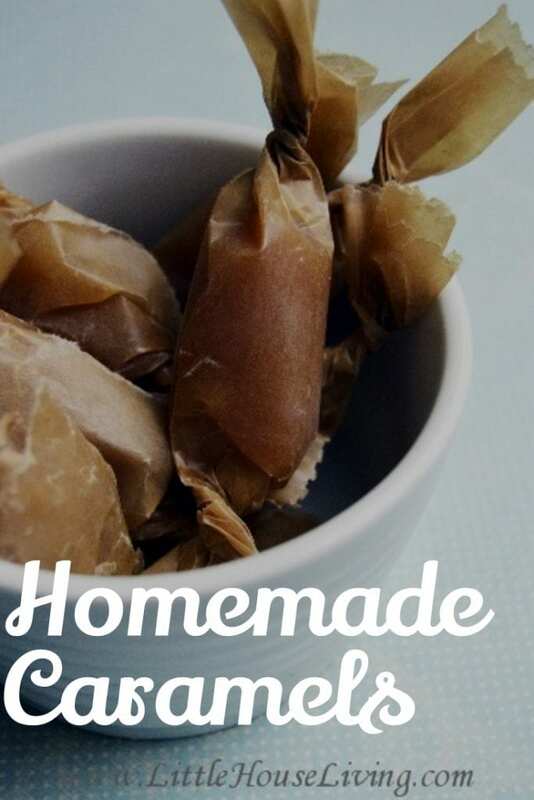 Have you been searching for the perfect easy Homemade Caramels recipe that does not contain corn syrup so that you can get a start on some holiday treat-making? This is our favorite recipe for homemade caramels and you only need a few ingredients to make it. If you are looking for another delicious must-try caramel recipe, you need to check out my Easy Homemade Caramel Sauce. There is nothing better as we are getting into the holiday time of year than all the yummy homemade baking. 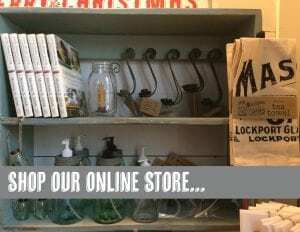 It just wouldn’t be the same if you bought things from the store! At least not in my house. Yum! That’s enough to get your mouth watering! 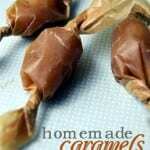 One of the new recipes we are making this year is this easy Homemade Caramels recipe. It contains no corn syrup and we use raw sugar instead of any kind of processed sugar to make it as natural as possible. Caramels are my very favorite (I like them more than chocolate!) so I’m always excited about making up a few batches of these and giving few batches for gifts. If I decide we can give some away! Here’s how to make them. Pull out all your ingredients. 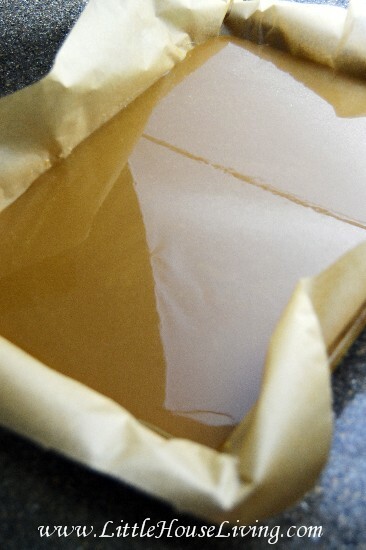 Start by placing a good sized piece of parchment or waxed paper out on your table or in a bar pan to be ready. You can place this in a cookie sheet or a baking sheet if you will need to move the caramels from your table at some point (since they need to sit for a while before you can put them away). In a saucepan, mix the cream, sugar, and salt. Cook over a medium heat, stirring constantly, until boiling. Just stir as needed until the mixture reaches 250 degrees F. You do need a candy thermometer for this recipe, it will not work on a guess. Luckily you can grab one for just a few dollars here. 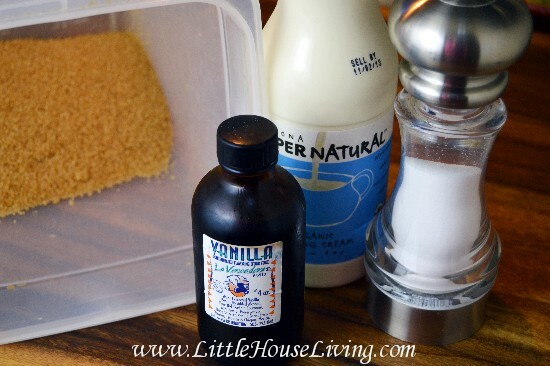 Remove from heat and stir in the vanilla extract until incorporated. 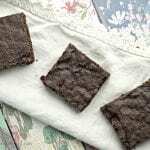 Pour the mixture onto your waxed or parchment paper on your table or baking sheet. I use an Unbleached Wax Paper. After your caramels have sat for at least 8 hours, use a knife coated in butter and cut out the shapes of your caramels. This will give it a nice buttery flavor plus help you cut through the caramel. 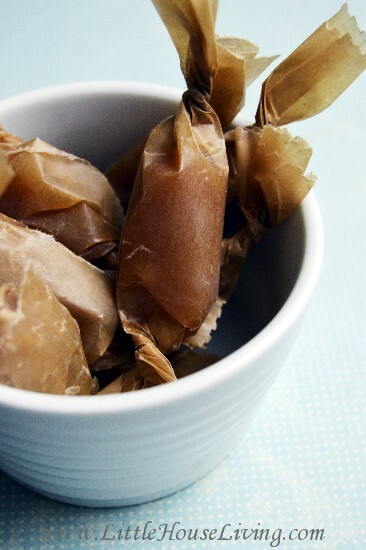 Using more wax paper, wrap each piece individually so they can’t stick together. Store the caramels at room temp. They won’t last more than a week so make sure you don’t make more than you can eat or give away during that time. Enjoy your yummy treat! These delicious easy homemade caramels only need a few ingredients for homemade candy perfection! In a saucepan, mix the cream, sugar, and salt. Cook over a medium heat, stirring constantly, until boiling. Just stir as needed until the mixture reaches 250 degrees F.
Remove from heat and stir in the vanilla extract until incorporated. Pour the mixture onto your waxed or parchment paper on your table or baking sheet. Using more wax paper, wrap each piece individually so they can't stick together. Store the caramels at room temp. They won't last more than a week so make sure you don't make more than you can eat or give away during that time. Enjoy your yummy treat! 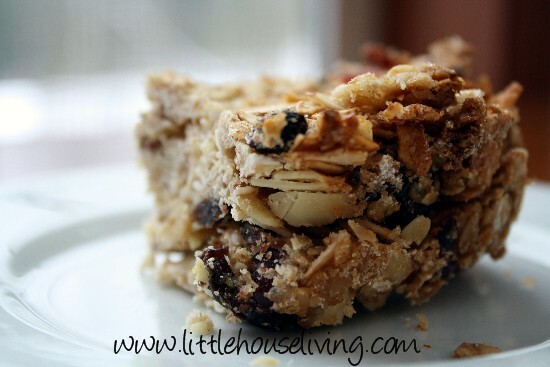 Find even more Desserts and Treats Recipes on Little House Living to make this holiday season! 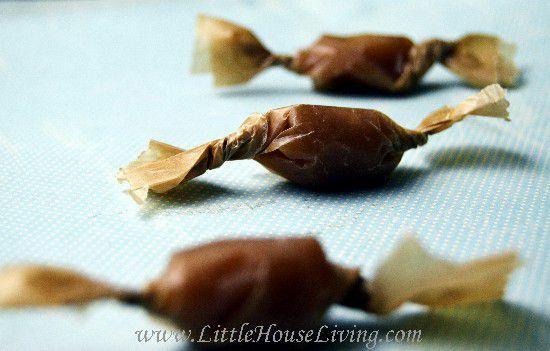 Do you have a special easy Homemade Caramels recipe that your family likes? How many different kinds of treats do you make this time of year? The picture show’s tub butter but I do not see it in the recipe. The butter is not used in the recipe, only in using with the knife to help separate the caramels when you are cutting them into pieces. Yummy! Now where do you find the brown waxed paper? Is it a “natural” variety of waxed paper? I’m betting this would be fabulous for candy apple bites, which makes me really excited! This looks wonderful–I have a taste for the caramel with a pretzel and some chocolate drizzled on top. Thank you for posting! 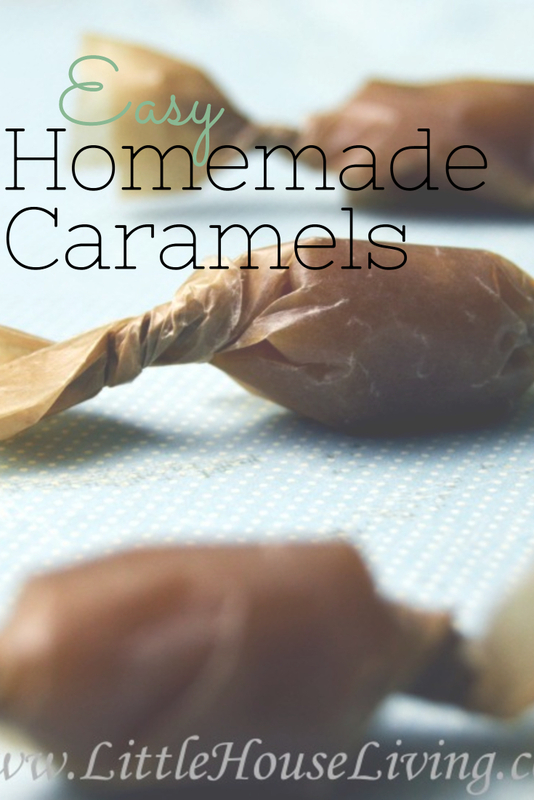 I love caramels, but have never tried making them from scratch. I will have to give this recipe a try. Looks great -I have never tried making them myself before. I”ll have to do this! Soooooo like my grandmother’s recipe! Even the finished product wrapped in waxed paper looks the same. One year I got so excited, because I found Christmas patterned wax paper. Had to make a batch of caramels for it. I’m glad people like you are still making homemade candy. Hoping for some advice on the carmels. We made carmels for Halloween. They were great for a couple of days and then they became very dry. Any ideas. Did you use this recipe? Hi! Why don’t they last longer than week? What happens? Just a textural thing, or do they actually go bad? Because there are no preservatives in them. They tend to get crystallized. What did I do wrong? They taste great but are stuck to the wax paper, cannot get the wax paper off? Did you cook them to the right temp? And did they sit long enough? Nope, not salty tasting at all, just adds a good dimension to the flavor. Great recipe Melissa! I love caramels, thanks for linking up at Showcase Your Talent! 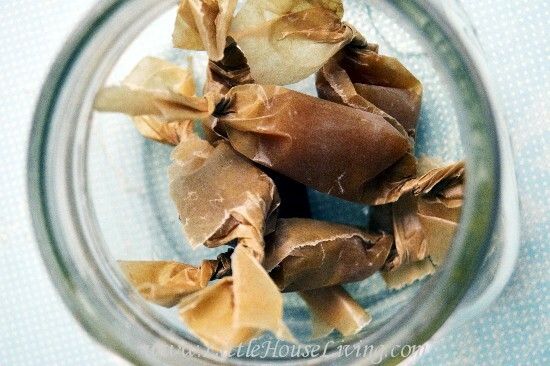 Love homemade caramels! Thanks for linking up with What’s Cookin’ Wednesday! I am wondering can these be used in recipes calling for caramels? I don’t think they could…if they are baked/cooked again it will probably change the consistency. We would really enjoy your Homemade Caramels and just in time for gift giving. Hope you are staying warm and cozy in this cold weather and thank you so much for sharing with Full Plate Thursday. 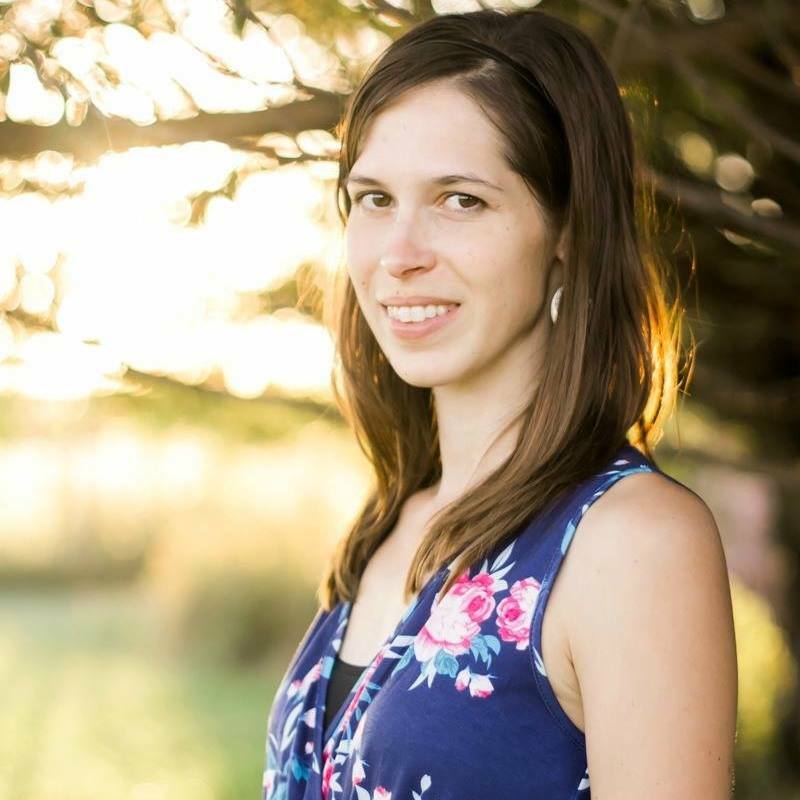 Merissa just wanted to stop by and let you know your featured this week at Showcase Your Talent Thursday #90! 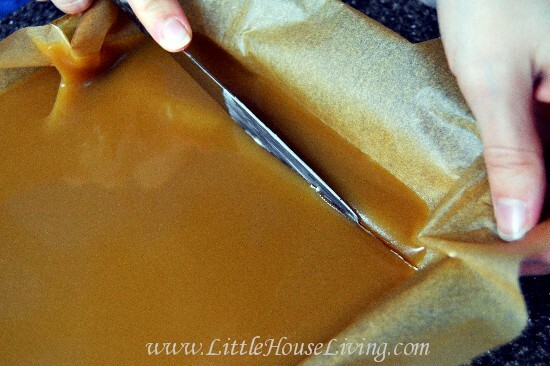 Love the caramel and I am cooling it on wax paper. BUT it does not want to separate from the wax paper. It has not been 8 hours but I am worried that after all that, that I wont be able to serve it because the wax paper is permanently attached to the caramel. Any thoughts? Was it cooked to the right temp? 1st batch tastes great, but i seemed to have done it to the wrong temp. they are not crackling hard, but not shiny or chewy either. i’m still going to cut & wrap them, they taste that yummy! any advice before i start my next batch? Just made these and waiting for them to cool! Thanks for this recipe. These look so yummy! I wonder if it would work to use honey instead of the sugar. May need to give it a try. We made a batch and it looked perfect, tasted delicious, but we left them in the pan overnight and they are still too gooey to cut, like it didn’t set right. As soon as it was 250 degrees we took it off the heat. This is the first time we’ve ever tried candies- do you know maybe where we went wrong? I couldn’t get it up to the temp? Highest I got was 230 F. I eventually gave up cause it all tastes the same in the end right? Oh well. Learn from my mistakes. any tips for next time though? Did you try putting a lid on the saucepan? Sometimes I’ve found that it can help when I’m having trouble getting it up to temp. Although on some of the newer stovetops I think they don’t go up to as high of a temp as is needed. Hi. Do you have an idea of how many caramels one recipe makes? I am doing a cookie/candy sharing weekend with friends. Thanks. It depends on the size you cut them, it will make a large bar pan full of caramels so at least around 50 or more? I am sooooo doing this. Thank you for the wonderful idea. This should make a great little Christmas gift along with my rumballs. Yum! I just recently tried making homemade caramels, too. I created a version with coconut milk, since my husband is allergic to dairy (although it still uses a little butter) and we loved the result, even if dairy wasn’t an issue! (http://syncopatedmama.blogspot.com/2014/11/coconut-milk-caramels.html if you want to try it out yourself sometime) I plan on making mine to give as Christmas presents, but hadn’t found the perfect thing to wrap them in, so I’m glad I discovered this post of yours! 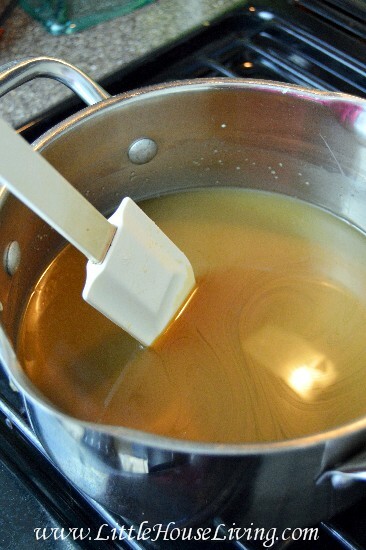 A handy hint for caramel making – be sure to calibrate your thermometer each year. Simply stick it in a pot of water, bring the water to a boil, and note how far off of 212 F the thermometer was. A couple degrees either way makes a big difference, and candy thermometers seem to change from year to year. That way your 250F will really be 250F! Mmm I love making candy. Thanks for posting. Hello from Treasure Box Tuesday. Yum! Thx for linking these tasty little numbers up to the Thoughtful Spot! These look amazing! Do you think they would turn out right if whole milk was substituted for the cream? I would stick with the cream for this recipe so the caramels thicken up well, otherwise it may be more like a sauce. This looks wonderful!! I don’t have a Candy Thermometer, is there any way that I can make the caramels without it?? It would be very difficult to tell when the caramels are the right temp without one and you may end up with gooey or crunchy caramels. I would highly recommend one. Thanks for responding so quickly:) Also, are these supposed to be soft or hard caramels? I ran out of heavy cream (I only had a cup left) so I looked up replacements and found that you can make a mixture of butter and milk (for 1 cup of heavy cream, you can mix 1/3 cup melted, unsalted butter and 3/4 cup 2% or whole milk). So I used a 1/2 cup of that and they still turned out nice and chewy. Plus, it makes them taste super buttery. My co-workers said it was delicious! I know what I’m making them for christmas! I would love to try your recipe! In reviewing it for making a trip to the grocery store, I noticed that there was no butter on the ingredient list, but in the photo of the mixture being stirred and cooking, there does seem to be a stick of butter melting in the pan. Am I missing something???? 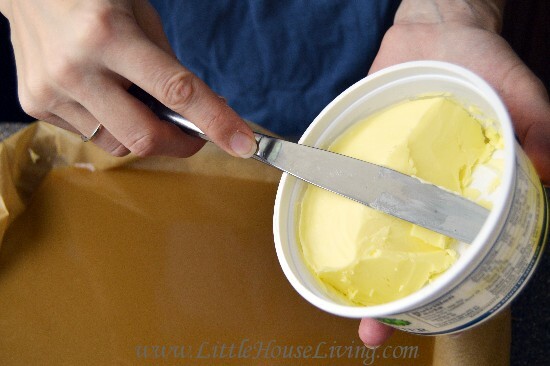 There is no butter in the actual recipe, however I do use a butter coated knife to cut. Thank you! I totally understood about the butter coated knife:) Maybe what I see in the photo of the pan with the spatula is a reflection of a light or something from above. Kind of looks like a stick of melting butter!! Thank you for clarifying. I made these, to temp, and everything looked perfect. Until I looked closer. The caramels literally crumbled to powder. Now, I did make a few variations. I added about 3T of butter to the mixture, substituted about 1/4 C of sugar for coconut sugar (I ran out), and poured it into a 7×11 pan instead of flat. The top edges were a delicious caramel, the rest was powder. What went wrong? I haven’t cooked with coconut sugar before so I’m not sure if that made a difference or not but I do know that caramels can be very picky. We don’t get candy thermometer in India. So how can I make it without a Candy thermometer? 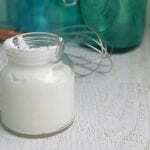 Could you use milk instead of heavy cream? Love this caramel recipe. Just what I was looking for. Love that there is no corn syrup in it – just natural ingredients. 😀 I’ll be using this for my dipped apples. Thank you for the recipe! I got it up to 250…is that high enough? I made another batch last night and elevated the temp to 275 and it burned 🙁 I wonder if the pot that I am using needs to be heavier? I tried this recipe and it was SUPER easy! I love how easy it was…BUT, it turned out a bit salty. I wonder what I did wrong? I doubled the recipe. About how long should i leave it at 250 degrees??? Can you make a huge batch a few days early for an event and then remelt the caramel batch on low heat and use it to dip apples? I am trying to put together a “make your own caramel apple” bar and am trying to stay away from corn syrup for about 150-200 people. You should be able to but I haven’t tried it so I can’t be 100% sure. Thank you!! I can’t believe how difficult Google has made it to find a caramel recipe without corn syrup or sweetened condensed milk! All the search results come up with is caramel sauce. Thank you, thank you, Thank you!!! So happy I found this site and this recipe. Can these be frozen, since I noticed the 1 week shelf life? I haven’t tried it so I”m not sure how they would turn out. Can you use half and half instead of heavy cream? It might work but I wouldn’t recommend it. More than likely the caramels would be too soft.